I know it’s a bit too late for a post-Halloween post (all the on-the-ball mamas probably did it by midnight of the 31st), but I’m definitely of the better-late-than-never mindset. This year, P, along with every other girl in her preschool wanted to be a princess. OK, I take that back, I remember seeing a mermaid. And a Princess Leia (Disney’s newest princess?). When I saw the gaggle of children at the Halloween “parade,” aka children wildly running to their parents in excitement as teachers tried to make them walk in a line, my first thought was: why don’t any of the boys want to be prince charming? They were probably having too much fun being firefighters, Humpty, and Dumpty to worry about rescuing all the girl preschoolers from the clutches of evil stepmothers. I’ve already chronicled my own issues with Halloween elsewhere, so I’m generally pretty determined that P will have a different Halloween experience. So, donning her Cinderella dress and tiara, she ran around with the other kids, and ate her treats. I’ll be honest: I had tried my best to have her pick another costume. Super Girl? Doctor? Anything else? The idea that someone of my flesh and blood could be so princess-centric is completely foreign. No one who knows me, even remotely, could ever ever in a million years call me a girly-girl. Not being a girly-girl is practically unheard of in Iranian culture. Almost every Iranian woman (and I only say almost because I’m thinking of my sister as the other lone exception) wears gobs of makeup, is always immaculately put-together, wouldn’t dare sunbathe in order to keep a clear complexion, is always wearing incredibly trendy clothing, and more likely than not, has had some sort of surgical enhancement, and looks YEARS younger than her husband, even though they are probably the same age. I realize that I’m making incredibly huge generalizations, but I know a lot of Iranian women who fit this bill. My lack of girly-girl-ness, however, came as a result of growing up in Iran. We moved from Iran when I was nine, and from the time I started school when I was six, I had to wear headgear to cover my hair. My solution, completely endorsed by my parents, who thought having to cover my hair at such a young age was completely ridiculous, was to cut my hair really short and pretend I was a boy outside of school. Minutes after the school bell would ring, I would run out of the building, tear off my headscarf, and sprint home. Ahhh what a heady feeling of freedom. I got to be so good at pretending I was a boy that a second cousin, who was in the military, was able to sneak me into the military stables and have me hang around with the horses. 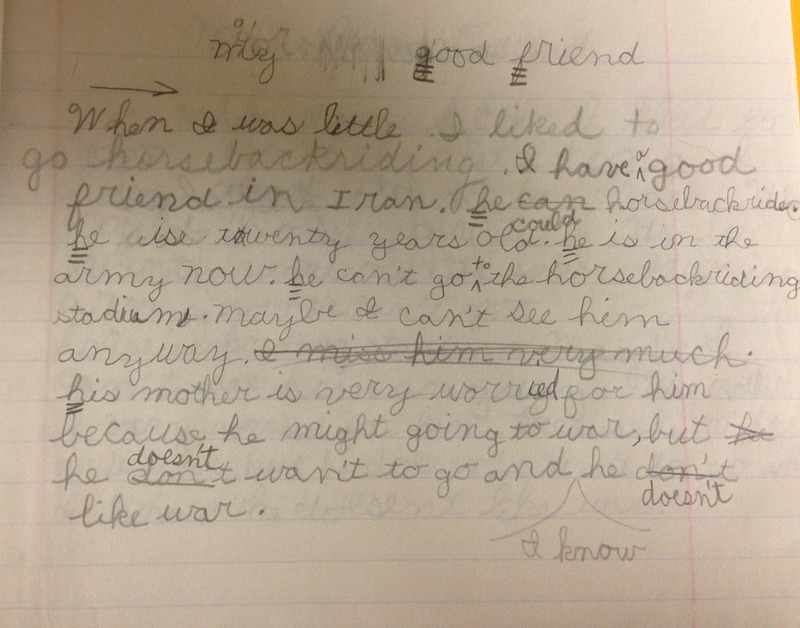 The obsession with horses, a staple of all girl childhoods, was definitely not lost on me. Once we got to the U.S., I tried to shed the tomboy tendencies, but it was difficult. I distinctly remember holding the door for an elderly couple at a restaurant, and being thanked in this way, “Thanks, son.” My English was still rocky, but I was shocked at not being recognized as a girl. So I figured the next step to becoming a “real girl” was acquiring a Barbie. So I shamelessly begged for one. The only one I was allowed to have was Astronaut Barbie, since my mom was not too keen on the whole princess thing. She did see the error of her ways at some point, though. I may have been the only teenage girl who was begged BEGGED by her mother to wear makeup (this generally happened in a frantic tone in the car as we were going to visit relatives, who were generally really well-put-together Iranian women). I was probably not the first teenage girl to be begged to wear lighter colors (I was no goth, but somehow she thought I was). All to no avail. What I find fascinating is that my parents are now the princess enablers in P’s life. My mom is getting an early start. There’s no need to pretend P is a boy in America. My mom is definitely getting all the girly-girl potential she lost with me in P.
I generally find it pretty amusing, and despite half-heartedly trying to get P to wear a different Halloween costume, I try not to be too militant anti-princess. P has a pretty healthy curiosity, likes kicking and throwing balls and rolling in dirt as much as any other toddler–boy or girl. And the following picture also gives me hope. 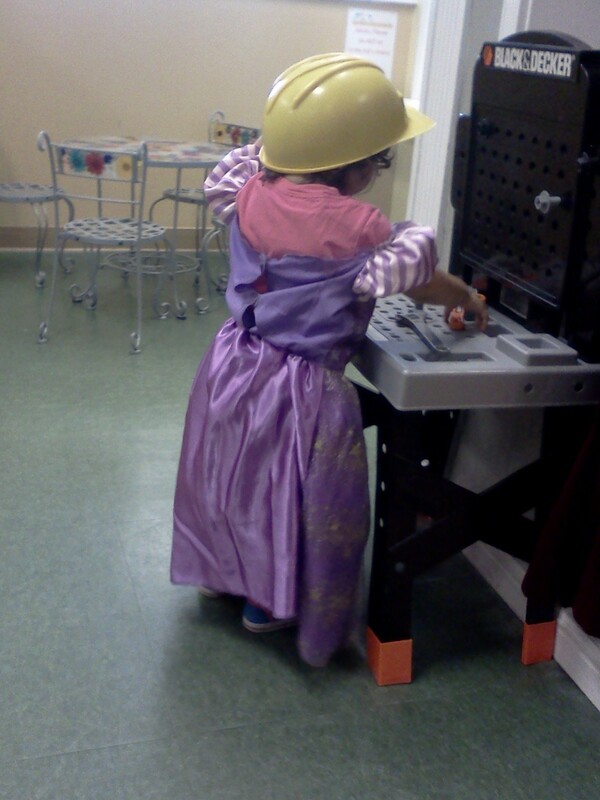 Any girl who goes to an indoor playground, dresses up as a princess and then proceeds to put on a hard hat and play with the Black & Decker toy tool set is probably going to be OK. I have no idea who came up with the phrase “as American as apple pie,” but I can assure you that no one outside of the U.S. considers apple pie to be as American as Americans think it is. Peanut butter…well, that’s a completely different story. I don’t think there’s anywhere else in the world that uses as much peanut butter as the U.S., if they use it at all. Or if they even know what it is. Apparently, the term “butter” throws people off. Outside of the U.S., it’s not seen so much as a texture, but as an ingredient. It made me wonder what foreigners think when they see apple butter or pumpkin butter in the market. Until recently, I was not such a big fan of the PB myself (that whole cleanse thing I did about a year ago changed that–it was big on nut butters). I still have this theory that no one born outside of the U.S. can really really love peanut butter. A. isn’t a big fan. He’ll pretty much eat it if there is nothing else around and he is famished. It’s probably like Aussies and Vegemite. Or living in Rome. You just have to be born into it or else it’s never going to feel natural. So it shouldn’t have come as a total shock (though it kinda did) when I discovered that P was crazy about the stuff. But not in a I-will-have-a-PB&J-sandwich-everyday type of way. More like peanut-butter-reminds-me-of-home type of way. When we were in Italy, we visited some friends who had just moved away from the Bay Area to live in Venice. They missed some American yumminess, including (but not limited to) dried mangoes from Trader Joe’s, Mexican food, and of course, peanut butter. They were super excited because they had just made a batch of PB using a very powerful food processor. They brought the jar out of the fridge, and P’s eyes just lit up. Vigorous nodding was happening when I asked if she wanted to taste some. I took a spoon and started scooping some out. One spoon led to four, at which point I gave my friends the jar back. Poor things, I didn’t want P to devour their tiny jar of prized PB in five minutes. Moments like these always come as a surprise to me. Logically, I know that P was born here and is growing up here. Emotionally, it’s still strange to be bringing up an American girl. She probably won’t be a completely all-American girl, but much closer than an all-Iranian or all-Italian girl. She will most likely like chocolate more than lavashak (the original fruit roll-up…but without sugar and SUPER tart…what all the Iranian kids want as a treat) and know the names of all the Sesame Street characters (I still don’t know Bert from Ernie). She’ll like Dr. Seuss and Maurice Sendak books, and wonder why I gush about Tintin all the time. Will P really be as American as peanut butter? We may have to start her on Vegemite soon, just to stir the pot (or jar) a bit.